Abstract: The focus of this article is placed on a significant and problematic field in public media – rhetoric and its specific manifestations in TV media and virtual (digital) media environment. The consistent development of technologies and innovation in the past decades introduced a new media model facilitated by the web. The dynamic development of the online presence required an urgent rethinking of rhetoric – from its broader definition as an art of persuasion in the context of public speaking and writing it is modified to an art of effective persuasion through the power of visuality. Therefore, some definitions related to the new media rhetoric, journalist rhetoric, visual rhetoric and virtual rhetoric are proposed in the articles. 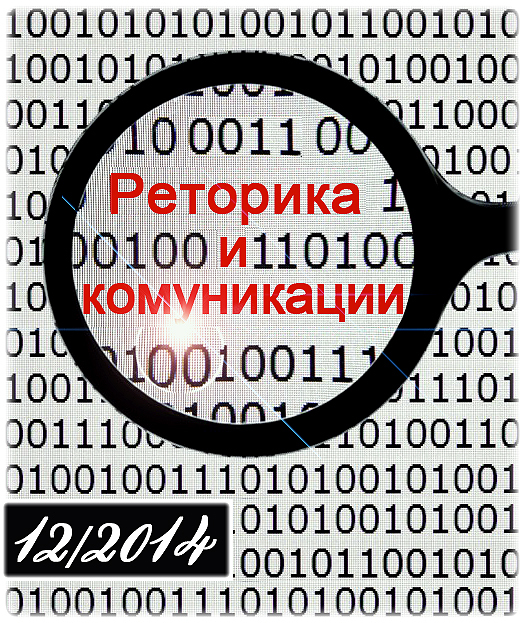 They will be а starting point for further researches in the field of new media rhetoric. Key words: new media rhetoric, virtual rhetoric, digital rhetoric, visual rhetoric, effective persuasion, new media environment. The focus of this article is placed on a significant and problematic field in public media – rhetoric and its specific manifestations in TV media and virtual (digital) media environment. The consistent development of technologies and innovation in the past decades let to a new media model facilitated by the web. The classical media channels needed an urgent adaptation to the new requirements of the market and focused on the constantly changing information as a core value. These new relations are based on “the operation of the communication and exchange of information remotely and particularly by exploiting the facilities by the internet” . The introductions to different e-concepts covered the specifics of Web 2.0 and Web 3.0 and adapted the traditional media coverage to the new social media platforms as Facebook, LinkedIn, Google+, and Twitter. It is oblivious that the rhetorical paradigm is developing, more or less triggered by the Internet evolution and that the emerging positions on new social media and internet platforms, forums, blogs, online newspapers and magazines are imposing co-existence of classic TV formats and new media channels. Even if the virtual rhetorical audience mostly overlaps with the real rhetorical audience, the expectations of different audiences are predefined by the media channels. The main thesis of the article is that the modern speaker or orator adapts quickly and flexibly to the new media space without underestimating the importance of the audience. The new orator prefers the combination of clear texts and modern visual forms that serve better to the innovative communication standards. These new standards lead to the urgent need of rethinking and redefining of the rhetorical persuasion techniques in media environment. The fluidity of the argumentative situation with respect to the audience is modified in the process of its engagement in argumentation . Therefore, the argumentative situation in the new media environment needs some reconfigurations, as the independent existence of traditional media channels (TV, radio, and print media) is now unthinkable. 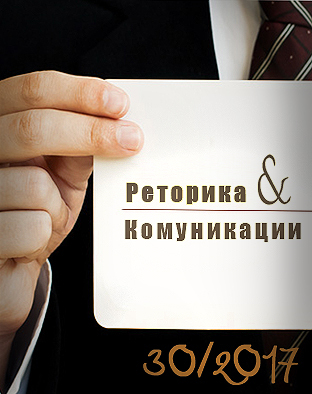 The TV channels in Bulgaria are developing increasingly aggressive content websites, social networks and blogs. Comments on the Internet, suggestions for topics and guests, photos and video reports are just some components of the inventory of modern media that lead to an enrichment of formats and themes. The development of web design and online media transforms the audience from a passive recipient of messages to an online peer communicator who has the ability to interact with the media experts constantly and immediately. The audience becomes a regulator of the information flow and carries more weight in decisions about the media content. In addition, the audience gains more confidence in its new role as a co-author. The dynamic development of the online presence requires an urgent rethinking of rhetoric – from its broader definition as an art of persuasion in the context of public speaking and writing it is modified to an art of effective persuasion through the power of visuality. The manifestations of visual in virtual environment in its convincing functions are rooted in the need to rationalizing the role of rhetoric to a completely new level. The visual techniques of rhetoric in virtual environment could be easily analyzed by the semantic frames, determined by their functions in the media virtual space. Images as part of the visual rhetoric are the main tools in the rhetorical persuasion in virtual environment. The flexibility of the online social networks is suitable for the development of persuasion techniques with regard to civil appeals. 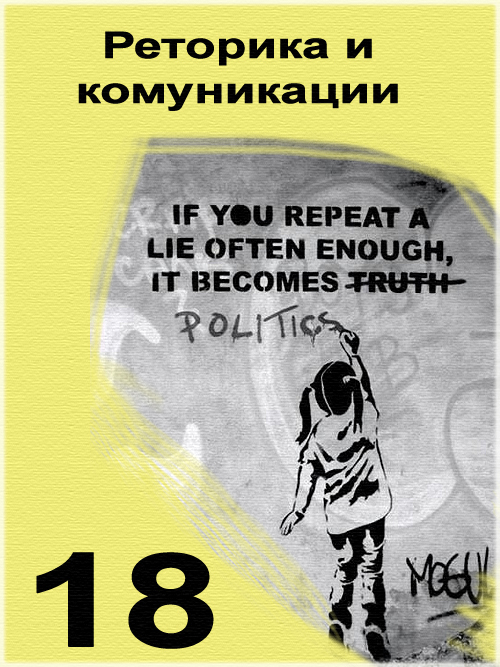 Therefore, the analysis of the visual in media political rhetoric is defined as a beneficial research field and suggests the researchers of visual messages related to the civil unrest in Bulgaria in the period 2010-2014 a great amount of sources. After years of declining of the audience on live TV, Twitter, Facebook and some mobile startups appear to be luring the audiences back to the TV content. The clever marketers need to use the desire of the audience/ fans to tap into the tweets, posts and check-ins in real time and to link them back either to the classical on-air content or internet possibilities for watching content online. Modern rhetoric does not only include verbal or written text, but it manifests itself through various channels and through a variety of forms. This article shares the understanding of Kenneth Burke that modern rhetoric is “rooted in an essential function of language itself” , rearranging the components of classical rhetoric for the use of the new digital media environment. Modern rhetoric is not just verbal or written speech and it manifests itself through various channels and through different forms. The rhetoric is not limited to political, public and/or media discourses, but it is a real element of communication on any topic and in any situation. Rhetoric as a science not only helps for a deeper understanding of any strategic communication, but also contributes to the successful implementation of specific media, political and public projects. Political rhetoric, for example, is the base of TV genres like news, infotainment shows, public affairs broadcastings and institutional internet platforms, forums, blogs, social networks, etc. These formats imply numerous rhetorical situations that oppose different opinions and beliefs, validate ideas and ideologies, introduce speeches and invocations. Indeed, the political discourse remains the paradigmatic example for studying and theorizing the specific techniques of persuasion. In the new rhetorical paradigm, however, these political statements are no longer introduced to the direct audiences, but are presented indirectly through digital media, social media platforms, video feeds and tweets . 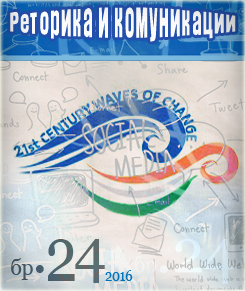 The emergence of the digital media challenges the researchers to rethink and redefine the modern rhetorical paradigm in order to introduce a new modern, flexible, theoretical, comprehensive review of classic and contemporary publications covering the fields of rhetoric, persuasion and media argumentation. The concepts and definitions proposed in this article are an attempt of the researcher to derive some basic definitions in the academic field of modern rhetoric without any claim to universality, uniqueness and completeness. 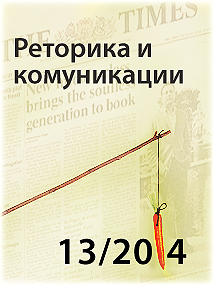 Till the beginning of 21st century the usage of rhetoric of journalism is broadly applied in the academic literature. However, in the last decade the term media rhetoric is used more and more often, which corresponds to the frequency of the usage of the term media and derivative terminology phrases as media communication, media studies, media advertising, media planning, etc. The text below offers working definitions in the field of rhetoric. 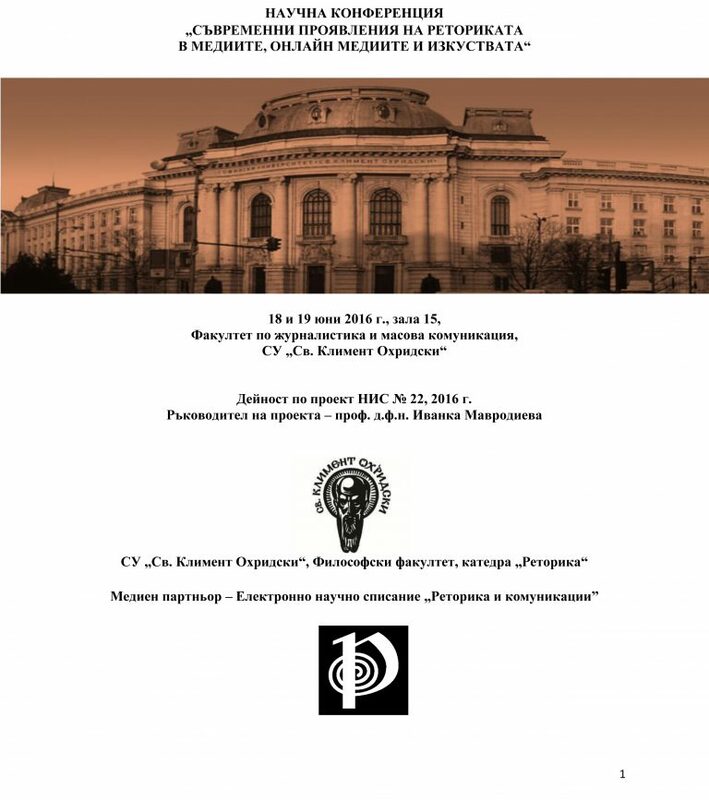 Even if they are a small contribution to the elucidation of the concepts in the scientific field of rhetoric, they enrich the categorical and conceptual terminology of the Bulgarian contemporary rhetorical theory. 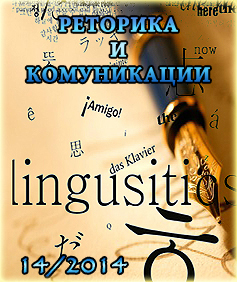 They are also important in order to create a methodology of research and study of these phenomena in the Bulgarian rhetorical context. The term media rhetoric is connected mainly to journalism, TV and radio hosts, online editors, show directors and actors in television shows. Media rhetoric is not only related to the behavior of the members of journalistic professional environment, but also to those who are in the role of respondents. Political media rhetoric, for instance, includes statements by politicians, party leaders, statesmen, leaders of national and international institutions and organizations in classical and digital media, as well as participation of these individuals in media programs and election campaigns, broadcast and disseminated by these media. TV rhetoric is seen as a manifestation and variation of media rhetoric. It includes verbal and nonverbal expressions of journalists and participants in various TV formats in a wide range of TV programs (news, TV shows, etc.). It is possible to separate the political TV rhetoric as a separate division, as it refers more to the media appearances of politicians, presidential candidates, MPs, mayors and councilors during election campaigns. In the scope of this rhetorical subdivision are speeches, sermons, statements and debates during the execution of politicians’ duties, as well as their participation in various crisis situations, using rhetorical genres, rhetorical techniques, rhetorical figures, tropes and arguments. Civil rhetoric is seen as a relatively new phenomenon in the modern Bulgarian political life and it is a common concept in comparison with the rhetoric of the protests . 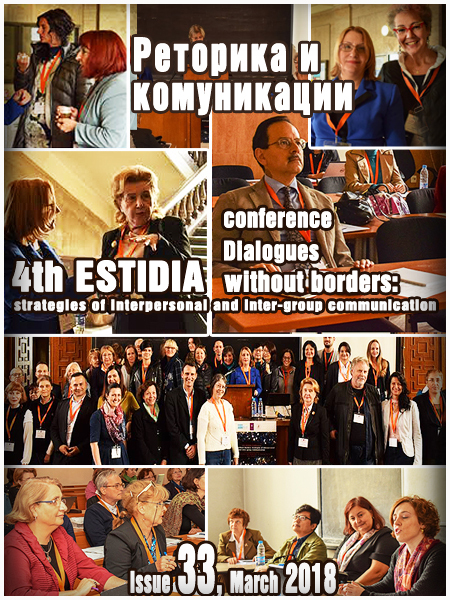 Civil rhetoric or rhetoric of the citizens covers their participations in dialogic formats, monologue statements on behalf of civil associations and NGOs. But civil rhetoric also covers citizens’ participation in protests, demonstrations, parades, during which are publicized civil platforms and requests through slogans, images, cartoons and invocations. Civil visual rhetoric is used in social media, blogs and websites. The rhetoric of protesters, for instance, has its potentials to develop quickly and efficiently in virtual environment. In this kind of rhetoric the leader is not always prominent and the main function of the digital media is to be a platform for organization and mobilization of certain groups of the society with the aim of participation in protest actions. 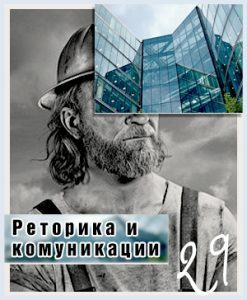 The digital literacy of the Bulgarian citizens can be combined with some rhetorical skills and experiences for successful communication on the web. As being anonymous web users, the digital citizens (e-citizens, netizens) are more flexible, more creative and they refuse to be just passive recipients of some messages. Even when they are only a part of the virtual audience, the internet users or netizens are already in a new rhetorical situation – they are distributors of messages and also creators of verbal and visual messages online, but they can also distribute such even offline in case of active civil actions. Civil rhetoric in virtual environment could be realized in dialogical forms like it happens in the internet forums, for example. The dialogues in such forums are much more dynamic, opinion leaders appear very naturally, the participants become legitimate through combinations of verbal and visual means. The rhetorical techniques in virtual environment should be analyzed by their semantic and semiotic frames, which in reality are determined by their functions in the media virtual space (online/ digital media). Therefore, publications about virtual and visual rhetoric, digital argumentation and communication have been definitely increasing in the past few years. A clear proof of the relevance of this issue are numerous conferences dedicated to the visual, visibility, visual rhetoric and communication. The ambitious beginning of this visual tendency is in the late 20th century – with the 1988 conference in New York “Vision and Visuality”, followed by workshops and schools discussing various aspects of the visual and virtual rhetoric. 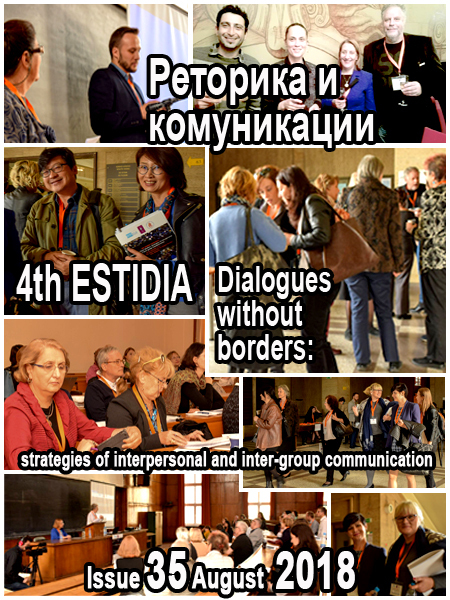 In 2010, The International Association for Visual Semiotics (AISV-IAVS) held its 9th congress titled “Rhetoric of the Visible. Strategies of the Image between Signification and Communication “, focusing its papers and discussions on the problems of visual rhetoric. It is worth mentioning the book of Crusius and Channell “The Aims of Argumentation” , which back in 2003 analyzes the reading of images, and the “understanding the visual arguments”. The visual arguments are classified into five subtypes: advertisements, cartoons, photos to articles, public sculptures and graphics . The virtual space is filled with images and links to other images that make it a fascinating environment to search and find information. Prints, for example, are influenced by the surrounding real and virtual environment. Boring black and white pictures, cartoons and graphic ornaments from the past are already in color, even in scientific journals and school textbooks. If not so, there would be no way for attracting the new audience, dealing mainly with digital / virtual images, hyperlinks and key words in virtual texts. More widely is perceived the notion that visual images, by analogy with verbal, could be rhetorical. Therefore, the potential of visual rhetoric should be carefully analyzed. According to Crusius and Channel, visual rhetoric is the use of images, sometimes accompanied by sound and / or messages that encourage us to action, inspired by the creators of these images . When examining the visual, it should be taken into account the changing environment in communication, as Ivanka Mavrodieva claims in her research on virtual environment Virtual rhetoric: From dairy to social networks . Bogdan Bogdanov talks about universal virtual world , as Ivaylo Dichev makes arrangement for the use of the term virtual turn by analogy with the term “cultural turn”. According to Ditchev “nowadays the information itself becomes a virtual world, in which infinite numbers of senders and recipients are coming and going.” . Indeed, virtual or digital rhetoric is the art of informing, persuading, and inspiring action in an audience through new modern media. It is an advancing form of communication composed, created, and distributed through multimedia. Online mediums are increasingly used as communication and information platforms, and since more text and images are placed online, there is more opportunity for persuasion through innovative and creative means. Digital rhetoric is advancing and changing the way people choose to communicate their ideas with broader audiences, as the functions of the readers are changed – they are already commenting on some information, changing it, responding to it with words, symbols and images. As rhetoric combines multiple methods such as persuasion, effective writing, effective speaking, and effective presentation of images and symbols to present information in inventive ways, the new media situation triggers it to define some new terms related to the rhetoric and to redefine some classical rhetorical concepts. The growing positions of new social media platforms and the rapid internet development require a good strategy and patience in order to attract new followers and to evoke credibility related to information. The success of this type of persuasive communication is only possible if time and efforts are invested in the rhetorical situations. As in real life trust and reputation are built gradually, the rhetorical practices in new media – they do not always find the right way to the target audiences. Such innovative projects as persuasion through social media pose some risks, since not all people are aware of the advantages of online media. Most opponents of the new media have no arguments to prove its inefficiency as a mediator between a speaker and an audience, but rather act with prejudices, because of lack of personal or professional experience with it. The distrust to new media proves the need of reconceptualization and redefinition of concepts that adequately would take into account the changes of the media market and thereby would stimulate the retraining of professionals from the field of traditional media in the field of new media. The rhetoric should come out of the mainstream of its traditional perception in order to focus on new practices. It should simultaneously try to maintain its influence on classical media (TV, radio, newspapers, etc. ), but also should attempt to adapt itself to the new media environment. 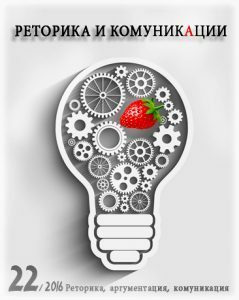 To sum up, this article is an attempt of the researcher to present in brief the current theoretical trends in media rhetoric in Bulgaria. 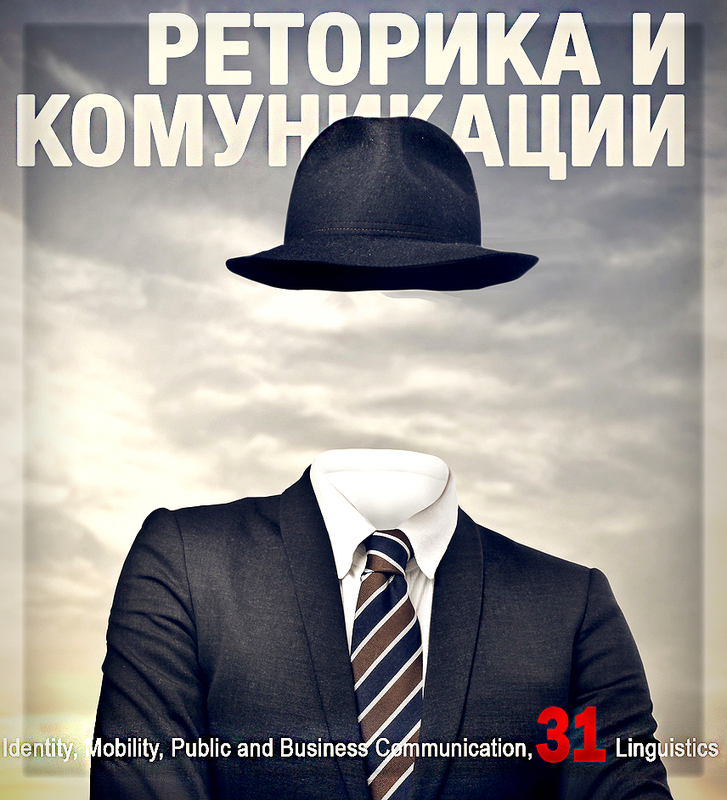 It identifies a number of modern rhetorical definitions, as part of the researcher’s academic work based on the Bulgarian rhetorical situation, focusing on media, visual and virtual communications. However, these definitions are still work in progress and they do not claim to be exhaustive, as the change of the rhetorical paradigm in new media is in an experimental period. Nerguizian, V. et al. (2010). Active e-learning approach for e-business. International Journal of E-Business Management, 5 (1), p. 49. Perelman, C., Olbrechts-Tyteca, L. (1969). The new rhetoric: A treatise on Argumentation (J. Wilkinson & P. Weaver, Trans.). Notre Dame, IN: University of Notre Dame, p. 44. Burke, K. (1950). A Rhetoric of Motives. London, England: University of California Press, Ltd. Print 43. Мавродиева, И. (2012). 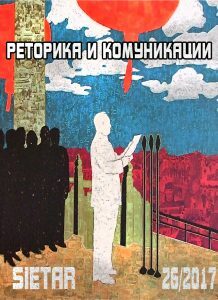 Политическата реторика в България. 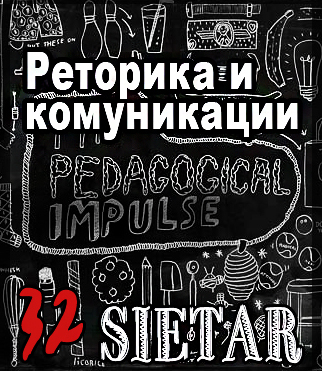 От митингите до WEB 2.0. София: Парадигма, 9. Мавродиева, И. (2013). Гражданска реторика на протестите: от площадите през медиите до виртуалната агора. Дигиталният гражданин (ред. 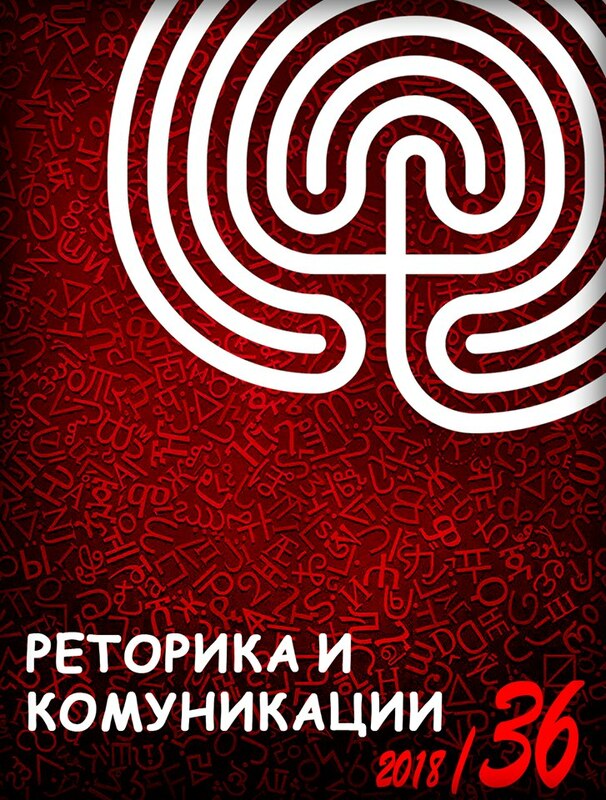 Кръстева А.) София: Издателство на НБУ, 248–266. Mavrodieva, I. (2013). 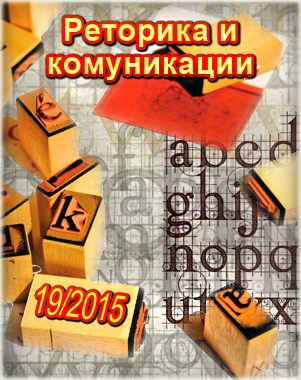 The functions of rhetoric in the Bulgarian public sphere. 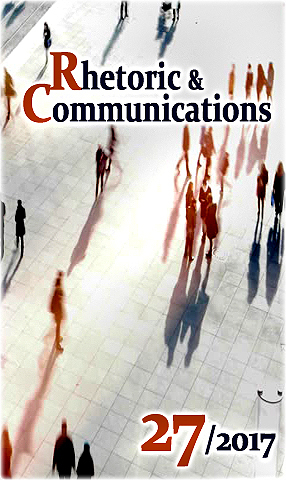 International Journal of Cross-Cultural Studies and Environmental Communication, pp. 86–98. Crusius, T., Channell. C., (2003): The Aims of Argumentation: A Brief Guide. McGraw-Hill Higher Educations, pp. 7–21. Crusius, T., Channell. C., (2003): The Aims of Argumentation: A Brief Guide. McGraw-Hill Higher Educations, p. 68. Crusius, T., Channell. C., (2003): The Aims of Argumentation: A Brief Guide. McGraw-Hill Higher Educations, p. 70. Мавродиева, И. (2010). Виртуална реторика. От дневниците до социалните мрежи. София: УИ „Св. Климент Охридски”. Богданов, Б. 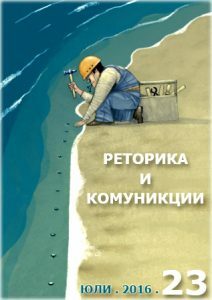 (2004): Култура и интернет-култура, Социологически проблеми, кн. 3–4, 54. Дичев, И., Спасов О. 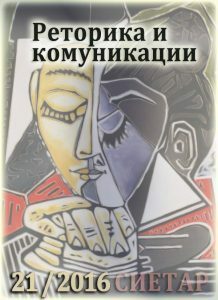 (съст.) (2009). Новите млади и новите медии. Отворено общество, София. Kjeldsen, Jens E. (1998). 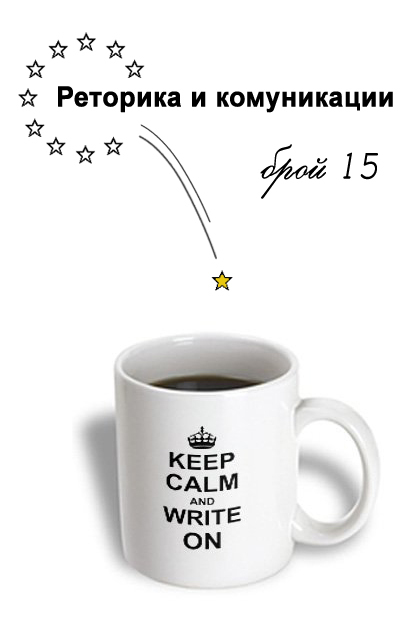 Visual Rhetoric—From Elocutio to Inventio. 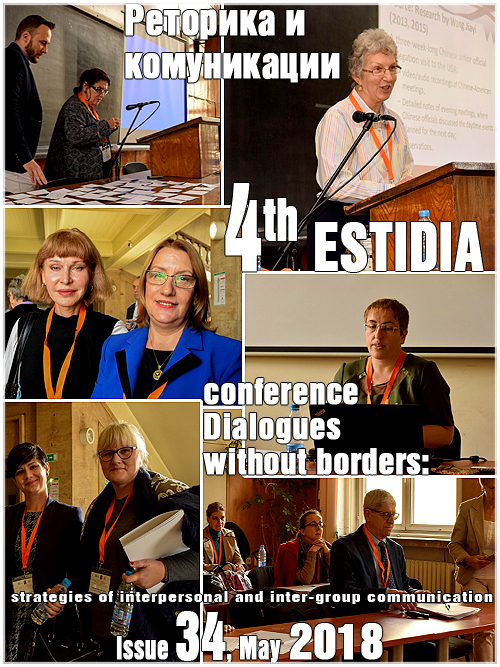 Proceedings of the Fourth International Conference of the International Society for the Study of Argumentation, June 16–19. Ed. Frans H. van Eemeren, Rob Grootendorst, J. Anthony Blair, and Charles A. Willard. Amsterdam: SIC SAT, pp. 455–460. Kjeldsen, J. E. (2012). Pictorial argumentation in advertising: Visual tropes and figures as a way of creating visual argumentation. In F. H. van Eemeren & B. Garssen (Eds. ), Topical Themes in Argumentation Theory. 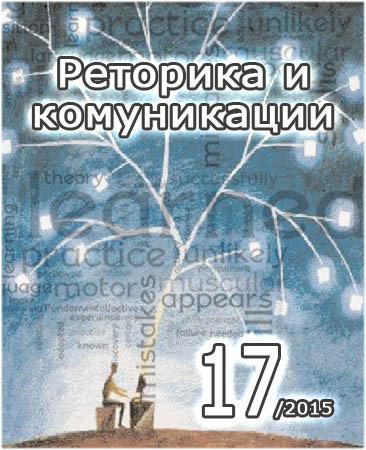 Twenty exploratory studies (pp. 239–255). Dordrecht: Springer.